A Zalából is szépen látszott, magasabban a Delfin felett és észak-nyugatabbra tőle, -4 körüli volt, fehér és közepes sebességű. 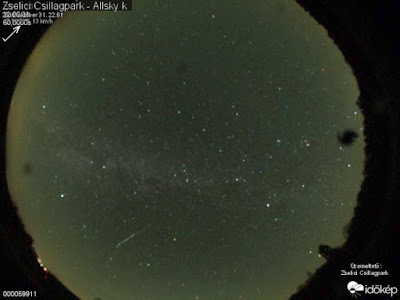 Jónás Károly felvétele ma a spaceweather.com nyitóoldalán az alábbi szöveggel:WATCH OUT FOR TAURID FIREBALLS: Every year in late October and early November, Earth passes through a river of space dust associated with Comet Encke. 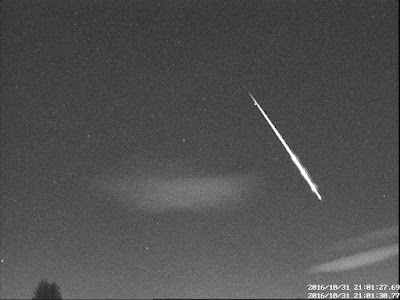 Tiny specks of debris hit Earth's atmosphere, producing a minor shower of meteors known as the Taurids. Although the shower is minor (typically, it only produces a few meteors per hour) it is nevertheless remarkable. The debris stream of comet Encke is spiced with gravely nuggets that tend to disintegrate as bright fireballs. 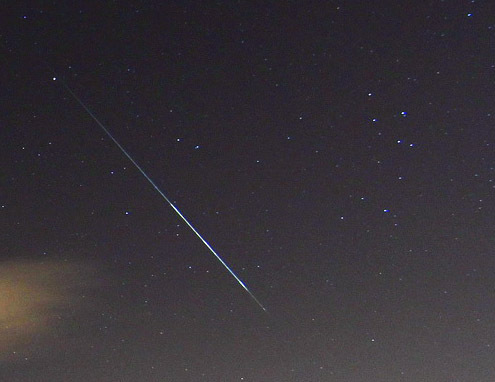 Karoly Jonas caught this one blazing over the bright urban lights of Budapest on Oct. 31st.